Founded in 1963, Building Adhesives Ltd specialises in the development, manufacture and distribution of tile adhesives, grouts, sealants, decorating and associated building products through its DUNLOP branded products. Revolutionising training in the tiling and decorating industries, the purpose-built ITC delivers a significant upgrade on the firm’s current Training Academy and features a state-of-the-art demonstration auditorium, practical training bays and meeting rooms. Providing the perfect platform for training in tiling and decorating techniques, skills and product use, the multi-use venue is available to a range of people in the construction industries including tradesman, installers, apprentices and colleges. A full programme of courses is available at the Centre, helping to raise standards across the industry and support vocational qualifications. Bespoke course are also available to suit individual requirements. Mr Bell said the investment in the new facility was part of the company’s overall strategDunlop Pro Decor Demo with Dave Rowley Training Manager Small v2y as the market-leader to increase its training provision and help raise standards across the industry. 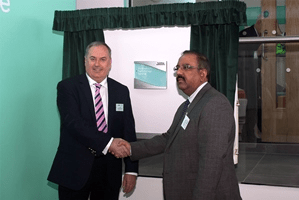 “Building Adhesives Ltd were the first manufacturer in our sector to offer industry training – and the first to open a training centre – so training and development has always been fundamental for us. Dave Rowley, DUNLOP Training Manager, who has been leading training at the company for more than 20 years, added: “The Innovation and Technology Centre provides a significant enhancement of our training facilities and allows us to cater for a larger number of delegates than ever before. “The large auditorium provides seats for 40 delegates, with a capacity for 100 delegates, and features high spec A/V and projection facilities and removable training bays for high impact practical demonstrations and theoretical presentations.